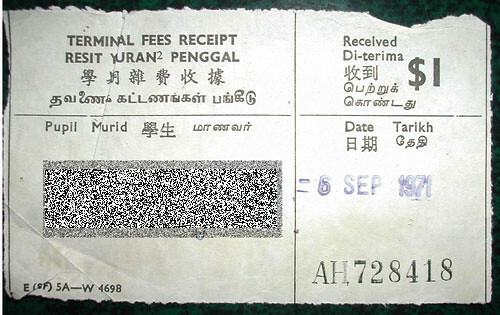 This was the receipt of my Miscellaneous Fees of $1 when I was in Pri.3 in 1971 at Beatty Primary School. I remembered that at that time, teachers have to spend quite a lot of time to collect the “School Fees” (we used to call them School Fees instead of Misc. Fees), instead of teaching. I loved such free time every month during fees collection period. Well compared the Misc. Fees of $1 at that time to now – see the increased in fees over time! So do you know why is it called Terminal Fees in the past? How come you only pay $1? I still have some 1967 and 1968 copies with me. They were $3. Yah that’s true. I paid S$3 for Sports, Library, Handwork & Science in 1961 for Primary 1 for 1 term. In 1 year there were 3 terms so 1 year total fees = $9/-. If I am not wrong there were pupils who only needed to pay the nominal $1 because the government subsidized for students from poorer social background. I think they call it social welfare cases. In some cases they also received free milk. I’m not too sure why I paid only $1 but I’m not the only one. Majority of the classes also paid the same amount. Maybe there were some changes after 1969.
peter, your e-mail address doesn’t work. Message I sent all bounced back. HamBearGer, maybe you can try gmail instead of yahoo using the same before the @. He gave me the email is gmail and there isn’t another problem.